WHEN AND WHY DID YOU START IN MMA? I tried out MMA back in 2012 because I was trying to find an activity to stay fit. I start seriously training in 2013. DID YOU PLAY ANY SPORTS AS A CHILD? Yes! I did swimming, track and field, basketball. I also was a basketball referee since the age of 15 until a few years ago. DO YOU HAVE ANY HEROES AND WHY? The strong women in my family are a true inspiration for me in everyday life. 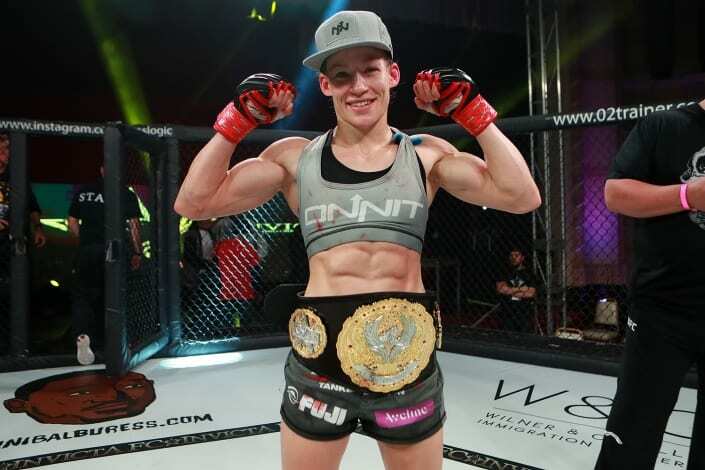 WHAT ARE YOUR THOUGHTS ON FIGHTING FOR INVICTA FC? I feel honored to fight for Invicta FC and to get to challenge the world’s top fighters. I’m here proudly representing Finland following former Strawweight champion Katja Kankaanpää. WHEN FIGHT FANS HEAR YOUR NAME, WHAT DO YOU WANT THEM TO THINK AND REMEMBER? Shining personality outside of the cage; Brutsku winning brutally in the cage.